Persons of Concern are defined here (the actual list of names appears at the “Persons of Concern” tab at the bottom left of your screen). These are a group of activist-oriented scientists known as the Hockey Team – as well as a handful of people closely associated with them in the Climategate emails. Journals of Concern are those that have published papers authored by Persons of Concern. One of the most disturbing things we learned from Climategate is that academic peer-review can be startlingly superficial. Phil Jones, the director of the University of East Anglia’s Climatic Research Unit (the source of the Climategate e-mails), told a UK parliamentary committee in March that, in all his years of publishing papers in reputable journals such as Nature and Science, no one has ever asked to examine his raw data or his computer code. Background levels of ground-level ozone have risen since pre-industrial times because of increasing emissions of methane, carbon monoxide and nitrogen oxides; this trend is expected to continue over the next 50 years ( Fusco and Logan, 2003 [MoS] ; Prather et al., 2003 [JoC] ). Changes in concentrations of ground-level ozone driven by scenarios of future emissions and/or weather patterns have been projected for Europe and North America ( Stevenson et al., 2000 [JoC, MoS] ; Derwent et al., 2001 [JoC] ; Johnson et al., 2001 [JoC, MoS] ; Taha, 2001 [NPR, MoS] ; Hogrefe et al., 2004 [MoS, ARC] ). Future emissions are, of course, uncertain, and depend on assumptions of population growth, economic development, regulatory actions and energy use ( Syri et al., 2002 [MoS] ; Webster et al., 2002a [MoS] ). Assuming no change in the emissions of ozone precursors, the extent to which climate change affects the frequency of future ‘ozone episodes‘ will depend on the occurrence of the required meteorological conditions ( Jones and Davies, 2000 [MoS] ;( Sousounis et al., 2002; ) Hogrefe et al., 2004 [MoS, ARC] ;( Laurila et al., 2004; ) Mickley et al., 2004 [JoC, MoS] ). Table 8.4 summarises projections of future morbidity and mortality based on current exposure–mortality relationships applied to projected ozone concentrations. An increase in ozone concentrations will affect the ability of regions to achieve air-quality targets. There are no projections for cities in low- or middle-income countries, despite the heavier pollution burdens in these populations. Hover your cursor over any of the above citations and voilà – full details appear. The red-coloured font tells us that 12 of the 14 citations in this paragraph may be of concern. The MoS after the first one tells us these research conclusions were derived via simulations. Since a simulation’s output cannot be accurate if its inputs are suspect, it’s important to receive this heads-up. With just a glance we now see that 10 of these 14 citations rely on modeling rather than on concrete, real-world data to reach their conclusions. We also see that 5 citations have been tagged JoC – which means they were published in Journals of Concern. One is tagged NPR – which tells us it is not peer-reviewed. 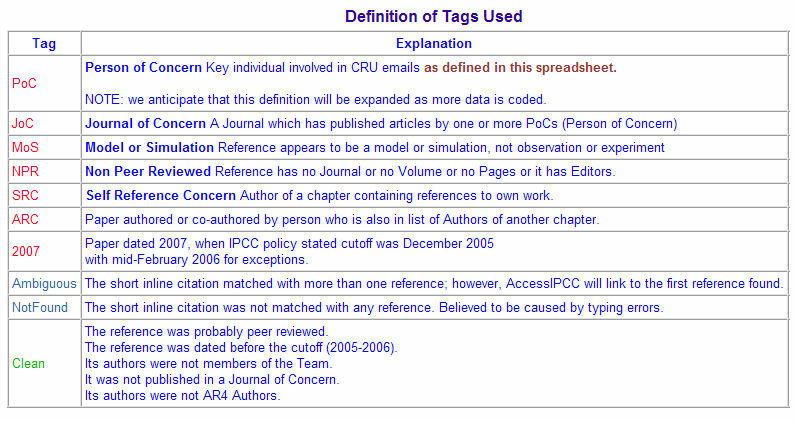 And two are tagged ARC – which indicates this particular research was written by a person who authored another chapter in the same IPCC report. This means that this chapter’s arguments rely on research conducted by 19 out of its 20 authors. Coordinating lead author Pete Smith felt it was appropriate to cite 15 of his own publications. Meanwhile, 13 papers authored by lead author Bruce McCarl are also cited. As those familiar with academia are aware, one earns brownie points if one’s papers are widely cited elsewhere. In this case, we see that such citations have been orchestrated by the authors themselves. The above results also lend support to economist Ross McKitrick’s view (see page 3 here) that one needn’t wait for the IPCC to write its report. All one needs to do is look at the people who’ve been assigned to a particular chapter and the outcome can be predicted in advance. That being said, AccessIPCC represents an enormous leap forward. We now have a more user-friendly – and immeasurably richer – way of evaluating the IPCC’s Nobel-winning report. Full disclosure: AccessIPCC is the brainchild of Peter B., who contacted me in March while I was coordinating the Citizen Audit of AR4 references. He and Hilary became acquainted and joined forces via that initiative. This entry was posted on December 7, 2010 by Donna Laframboise in activist scientists, climate bible, climategate, IPCC and tagged AccessIPCC, Bruce McCarl, climate bible, climategate, Hilary Ostrov, Intergovernmental Panel on Climate Change, IPCC, Pete Smith, Ross McKitrick.